← Fish hook, Japanese, Rear Main Seal Leak – Not! Just prior to lunch Patti frees me from grand kid duty, and before she headed off towards what the kids refer to as “the special park”, Lucy and I are at my special place. As Lucy dog and I round the corner, not far off in the distance is what materializes as a newly rebuilt and painted blue Perkins diesel. What appears as a small band of men hovering over an engine hoist, actually is! They (5) of them are atop a newly varnished wooden ketch; with everyone voicing an opinion as to how to best maneuver the Perkins. Before heading over for a closer look I change into what I can now refer to as boat working clothes. Just a few more uses and this set also gets tossed away. Today, it’s the Danish Marine work shirt and former hiking pants that are now cut-off shorts. The guys gladly welcome me as I, without asking jump on board and onto the engine hoist. Three of us are now counter balancing the opposite end of the hoist that has since lifted the Perkins from the dock, over the newly varnished railings and onto the seat lockers. Did my added body weight really keep this engine hoist from flying off the cockpit seat and over the side? One will never know. Push or rather pull her back, “the owner shouts” as we attempt to drag the hoist backwards, encountering resistance from the boats steering wheel. I notice a strap around the mast and engine hoist and so does one of the workers. With its release, the hoist is pulled back and the engine narrowly misses the newly varnished wood railings. Notice the hoist in the bottom picture, minus what is referred to as an “engine leveler”. The missing part would’ve made the job of maneuvering the engine, once on board, a bit easier, this crew compensates by manhandling the Perkins. Step one (1) almost complete. Now they have the added task of getting it down and into the bowels of the wooden ketch. My job is now done here, except for shooting the above video, for your viewing pleasure. Now back to the Western Flyer for some more painting and sanding. Here is the start of my project. 3M acrylic putty that I am using to seal the teak trim that goes around the entire inside of the fly bridge. Next I will smooth sand the trim piece and apply paint, burgundy or white? Not yet decided. Note in these two pictures the separation between the fiberglass deck and the teak trim. Perhaps now you’ll gain a better perspective of the job in progress. Without the acrylic putty any water that previously fell outside of the fly bridge quickly made its way into the fly bridge and puddled up. Now I hope the water is able to channel itself away and out. This corner teak piece was previously broken. The putty sealed it in place and now just needs to be built up, sanded and painted. Perhaps now you can appreciate the full scope of the work in progress. Tasks to be done before returning to grand kid duty. 2. Tape area to be sanded. 3. Sand all five lockers. 4. Remove the steering wheel and take it home to complete. 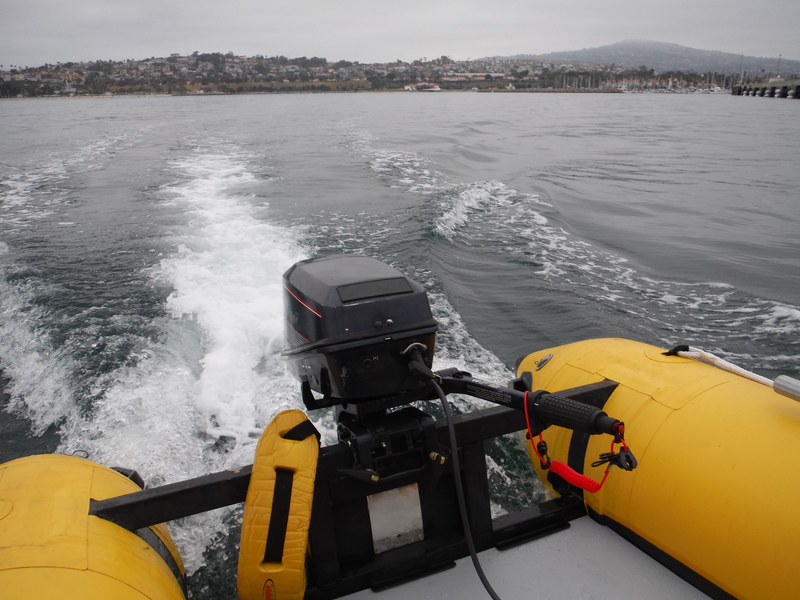 Sunday’s dinghy ride with my neighbor Tim – testing out the 6 HP Evinrude on the catamaran dinghy. 6 HP planes quickly with one person, a 9.9 at 54 pounds would be the ticket. This entry was posted in Miscellaneous Other, Uncategorized and tagged engine hoist, grand kids, Perkins, western flyer. Bookmark the permalink.